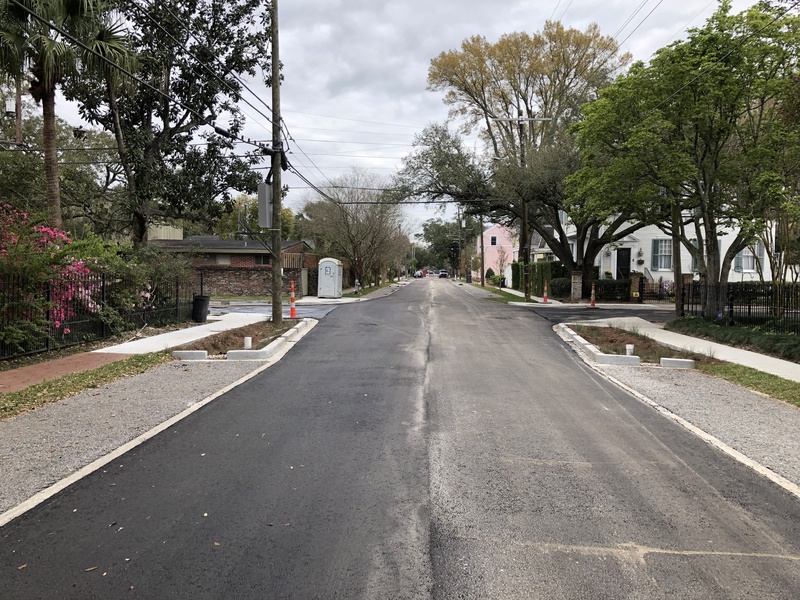 The city’s Department of Public Works, in conjunction with the Sewerage & Water Board of New Orleans, announced it has substantially completed the infrastructure improvement project on Cherokee Street between Benjamin and Pearl streets. The work began in June 2018. The work in the Black Pearl neighborhood included replacing existing water lines and installing new sub-drainage lines, repairing damaged sewer lines, repaving portions of the roadway in asphalt, installing rain gardens and a pervious parking lane to reduce subsidence and detain storm water, replacing damaged sidewalks and driveway aprons, and installing Americans with Disabilities Act-compliant curb ramps at intersections. Crews will be on site for a few more weeks cleaning all existing catch basins, adjusting water meters and performing general cleanup duties, city officials stated. The project was designed by Professional Engineering Consultants Corp. and built by Fleming Construction Co.